with during the stamping process. Love this one and love both templates thx! This just makes me smile! Thanks! This is such a cute card. Love the tri-fold. Woo-hoo, more templates! Thanks a bunch!! Lovely, lovely card! This is a neat design that I’ll have to try. Thanks for all the ideas you give me. Oooh…pretty colors! And cute scalloped edges! I love the fold, too. This is a FABULOUS card!!! How cute! Love the trifold … thanks for the template. I did this! It is so cute! Love this card. Thank you for the template and instructions. Very cute!! Thanks for the template! You are blowing my mind girl! what you are doing with these stamps is fascinating. Pass some of that Mojo my way! 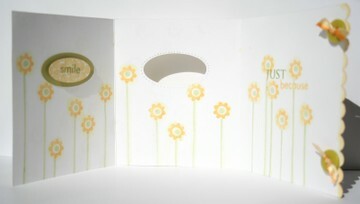 Love the tri-fold card with the window which is unexpected and so cute. Loved the softness of the colors. I want to make one. How cute! love this card…thanks for sharing! Oh! just love it! The soft springy colors and the trifold are just perfect – can’t wait to give it a try. How unique! I want to try this – looks like a fun design! Thanks for sharing! This is beautiful. Thanks so much for sharing the template. I’m on my way to stamp a card or two. The scallops are great, too. I am scallop challenged! Thanks so much for the instructions to this tri-fold card! I’ve always wanted to make one but wasn’t sure how to go about it! This one is wonderful! Thanks! all i can say is: WOW!! Thanks for the template! I can’t wait to try it! Great tri-fold design – I love the button closures! how did you do the scalloped edges? I adore that look. Did you buy it already scalloped or are you one of the crazy gifted gals with a craft-blade…? soft and simply elegant! can’t wait for spring! I like the tab closure on this one. Neat! Thanks for sharing. You certainly know how to make a card sing. I remember when Cami first came up with this little trifold twist and you have totally done it justice!!! Your new stamp set totally rocks! this is *such* cool card! I love the window! This is beautiful. Thanks so much for sharing the template! What a fabulous card! love the pretty colors too! Thank you for the instructions. I am always looking for new fun cards. This one is beautiful! Love the card! Thanks for sharing the template! Great tip on the wet brush technique! Thanks for sharing the templates. Very nice card! I love the stamps here and the card is great. Thanks again for providing a template! This one made me smile the minute I saw it! thank you for the template. I love this!! Thanks so much for sharing the template. Another beautiful example. Thanks for these great samples! I really like how you stamped the flower inside. oh my this is sooooooooo lovely. Simple lines again but very effective. Just love this card. Thanks for sharing. Thank you so much for yet another template!! What a sweet card! Thanks for sharing the template! I’ll have to give it a try! This card is probably one of my favorites! Love the tall flowers! The trifold template is wonderful, thanks! Great idea – I’ll have to try this with my coluzzle. The flowers are sooooooooo cute too! Wonderful idea. I like the use of the oval punch. Thank for the template. This is just beautiful! I love the flower stamp, they are so cute!! I have always liked this tri-fold and it’s even cuter with the oval window; thanks for the template and the ‘watercolor’ tip! This is stunning! I’m definitely putting “tri-fold card” on my to-do list. the templates are *most* helpful, thanks for taking the time to share them. Love the trifold card! Beautiful! oooooo, Lovely. Thanks for the pattern. Can’t wait to try this card. I’ve never made a Tri-fold card. I’m going to have to try one after seeing this. This card is so pretty. I love different card folds. Thanks for sharing the template. Your cards are just so pretty. I love the simplicity of it. Can’t wait to see your designs! This is so soft looking and lovely! That is the coolest way to close a card! I just found you-I love your “pad”. Keep up the great ideas and templates! What a great card! I love how it unfolds and the window is very cool! Thanks so much for the template and instructions! What a gorgeous card!! I love the cleanness of it and those flowers are adorable!! Very Pretty! Love the colors! 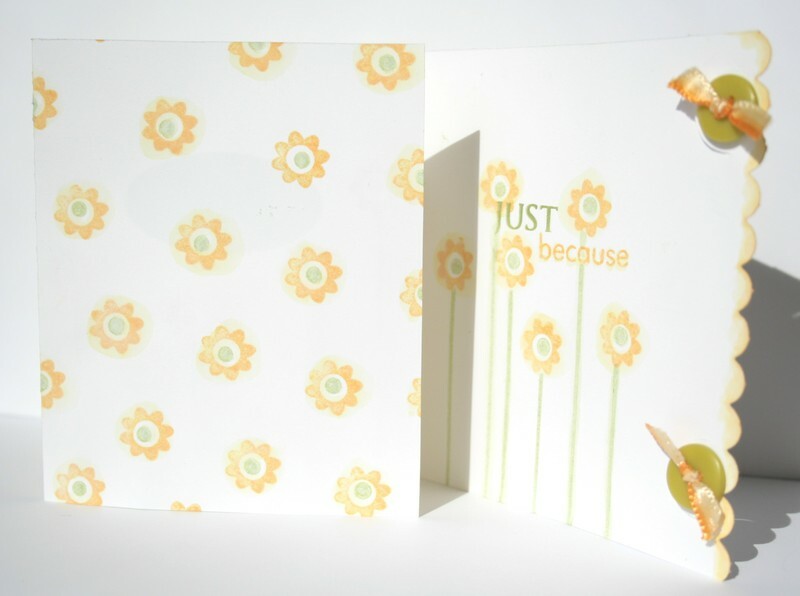 I just tried this fast and adorable note card. Thank you for the template and creative idea. How did you make the scalloped edge? Did you use scissors? What a fabulous idea. I’m going to try this out tomorrow. Thanks for that. I’ve been wanting to use my slit punch to make a scallop on the card edge for a while now! This is a very nice card! I can’t wait to try it! I love this card, and just the little added touches make it so unique, can’t wait to try the template! This card is gorgeous! Love the folds! I love the fold! thanks for sharing the template and instructions ~ I will have to try this soon! Great layout and great idea about the moist paint brush. I’m definitely going to have to try that one out soon. This is absolutely adorable. Thanks for the instructions. Thank you for the template. Your cards all look so professional. I hope I can do a decent job of casing this one. It is beautiful. I’ve already posted once, but thought I’d let you know – I tried the cards (the directions were so simple). I made my grandson’s valentine card. I omitted the punch on the front & used a penguin – It turned out so cute! love how the card keeps getting better and better as you open it! I think this might be my favorite of all your cards! Love your watercolour technique! And I like the closure with those buttons…you’ve given me an idea on what to do with some pretty buttons I’ve been hanging on to. And I’m always interested in cards which are easy to reproduce. Thanks so much!